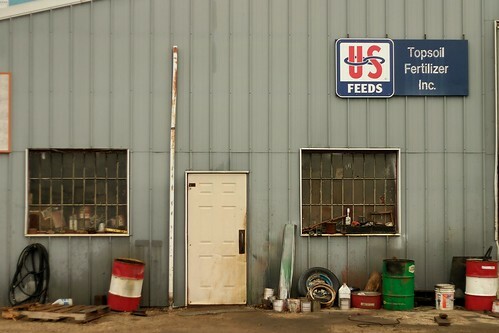 Ted’s Shop – Peterson, Iowa, posted by Matt Niebuhr. This photograph is a sentimental to me. I remember coming here when it used to be called “Ted’s shop” with Dad when we lived on the farm. My sister’s and I would each get one of those Purina branded suckers – all red with the white checker board lines – (you know the Purina Brand animal feeds)… from the sales counter while Dad (or Mom) was busy putting in orders for more pig chow… or fertilizer….Anyway, I remember being fascinated – absolutely, with the scattered “junk” in the machine shop… Ted is a Swede who can fix any machine and I believe has made a few custom ones of his own… Great memories…. AND…. today is my sister’s birthday – SO – Happy Birthday Rachel – remember this shop ??!! This entry was posted in Buildings, Matt Niebuhr - Photography by Matt Niebuhr - West Branch Studio. Bookmark the permalink.